Reflecting Malta’s centuries-old historical and cultural diversity, the Mediterranean island’s cuisine offering is every bit as varied. 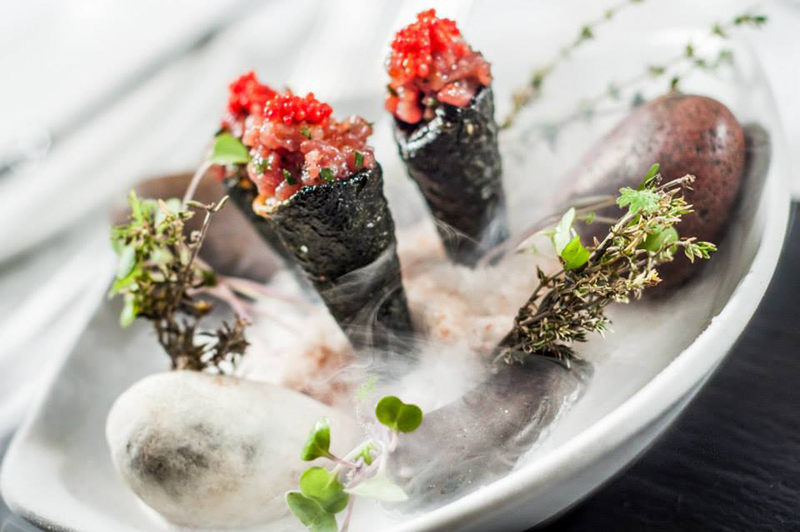 Here’s a selection of the nation’s best restaurants to try. Tucked away halfway along a small street off the main waterfront in the coastal district of Sliema, this popular traditional restaurant emanates rusticity and ambient warmth. Low-ceilinged with a natural stone and tile floor in terracotta colors and sturdy wood tables, it reflects a countryside atmosphere with bustling, friendly servers. Its furnishings pleasantly surprise as in an assortment of bric-a-brac lining upper shelves mounted around the walls including a cricket bat, statues, mini-busts, and even an old car license plate. Old oars crisscross the ceiling and a cast-iron oven from a bygone age stands in a red-bricked corner, a legacy from the restaurant’s former life as a bakery. Old-fashioned glass lights enhance the overall feeling of home comfort. Ta’Kris, we found out, is a place where clients rarely go home hungry, portions being more than generous. Our dinner started with a mixed Maltese platter consisting of bigilla (a traditional dish of mashed beans and garlic), aioli (a paste of breadcrumbs, tuna, garlic, and tomatoes), beef and pork sausages with herbs and fennel, Ftira bread and Gbejna, a sheep cheese from the island of Gozo. A smattering of capers and olives, as well as sun-dried tomatoes in caper sauce, peppers and herbs with mixed roasted vegetables including mushrooms, zucchini and cabbage complemented the platter – it was more than enough to feed a party of four. Highlight of our dinner was bragjoli (or bragioli) a main dish comprising thin slices of beef, folded around minced beef and cooked in the oven, with a blend of cheese and spices. We finished off with local desserts – imqaret, small patties filled with dates, and helwa tat-tork, a sesame and almond-based Oriental sweet. A memorable repast in a cozy place. Hidden just inside the imposing battlements of Malta’s former medieval capital, Mdina, known as the ‘Silent City’ due to its hefty fortifications, labyrinth of narrow streets and vertical walls, Medina Restaurant has been the fiefdom of Noel Debono since 1980 when he converted it from a tearoom. A graceful host who involves himself in every aspect of the restaurant, Noel has created an authentic old-world style ambiance enhanced by 12th century vaulted stone ceilings, terracotta-tiled floors and thick limestone walls dating from the Norman era. An open log fire adds to the warmth of the welcome that awaited us. In warm evenings, guests can also dine in romantic surroundings outside beneath a flowering Oleander tree in the vine-clustered courtyard. After an amuse bouche of celeriac cream served in espresso cups, like a macchiato, with black garlic droplets on top, we settled down to a plate of scallops with fava beans, lentils, tomatoes, parsley and bacon bits and seafood linguini, light on cream with cherry tomatoes. A highlight was the octopus stew, the mollusc’s body served with generous lengths of tentacles, all cooked in a dark sauce and served with walnuts. Having heard that rabbit is a popular dish on the island, we ordered it and promptly understood why, tender meat cooked in a wine and thyme sauce. A reputable choice with efficient service offering a glimpse into the past. 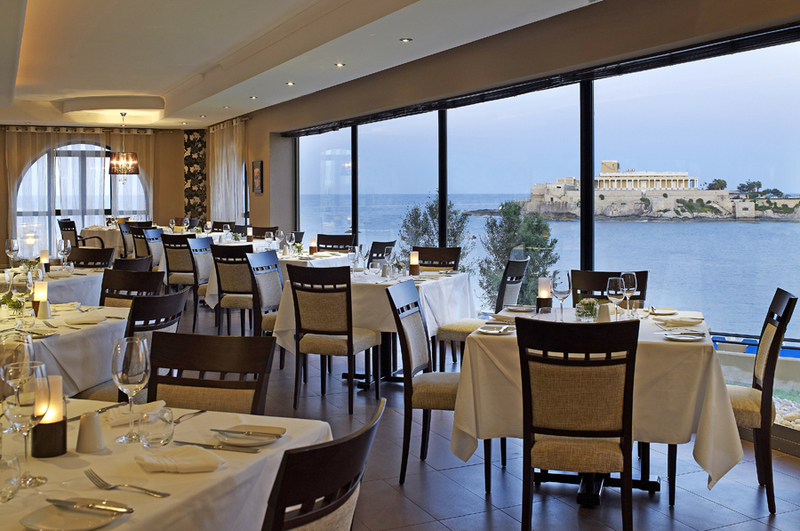 There’s probably no more convenient location, both for downtown Valetta residents and wandering tourists, than that of Malata Restaurant – 50 meters directly across from the Palace of the Grand Masters, now housing the Office of the President and parliament, in the town’s central square. Signalling its pedigree – 550-year-old bakery ovens near the back kitchen attest to that as well as its ongoing reputation as a restaurant under various names since 1897 – limestone stone steps lead steeply down bare-rock walls to the intimate, cavernous dining room below street level (an attractive option in warm weather is the open courtyard in front). Adding a touch of light-heartedness to the restaurant’s weighty historical significance, framed pencil caricatures of politicians, celebrities and other notable guests line one wall. Soothing jazz music plays overhead. Renown for its fish and seafood, the comprehensive menu didn’t disappoint, with catches of-the-day including sea bass, swordfish and grouper, the latter baked in salt. My companion opted for linguini with fresh prawns infused with coriander, dill, basil and lemon and let out a sigh of delight upon the first bite. “You must taste this, it’s divine,” she murmured. I did and agreed, the mix of herbs close to perfection in its resulting blend of flavor. While there is a tempting menu of meats, I remained all at sea, finally succumbing to a tantalizing trio of thinly-sliced Carpaccio of tuna, salmon and swordfish and grilled calamari for the main. If you want a sense of history, both past and present, no better place. Tired of traditional dishes? Then the sophisticated Blue Elephant Restaurant lush with tropical foliage, flowers, exotic tapestries and a flowing waterfall and river feature, may be just the place for you. It certainly provides a variety of choices, both in food and beverage, with the cocktail menu alone covering two full pages. Here, in an elegant atmosphere with seating for 220 people, both indoor and out, I enjoyed a ‘Royal Thai Menu,’ a veritable feast of food. When plates and bowls began to arrive one after another, each trumping the other for sheer delicacy of taste, I felt like Yul Brynner in ‘The King and I’ – strips of grilled marinated chicken served with a cucumber and peanut sauce; minced lamb stuffing with red sweet and sour sauce; crisp golden cakes with prawns and sweet corn; salad of crispy minced tuna fish and prawns with organic lemongrass and ginger; tom yam soup and stuffed egg pastry with Philadelphia cheese. And these were just the starters. Five mains followed including chicken, beef, vegetarian and seafood leaving me filled to bursting point. Fortunately, I had three companions to help share the delicious burden. The Ped Makarm, slices of marinated magret of duck, grilled and served on a layer of seaweed topped with exotic sweet and sour tamarind sauce, was a highlight, as was the southern Thailand dish of Massaman, a lamb curry dish marinated in spices cocooned in coconut milk, Thai sweet potatoes, roasted peanuts and cashew nuts. According to the restaurant’s menu, the latter dish was penned in a classic poem by Persian King Rama II. It certainly merited such literary immortality. As if the starters and mains were not enough, along came desserts. Being treated with exquisite traditional Thai hospitality, it would have been impolite for me to desist. I didn’t even try. Suffice it to say, it was sumptuous. My advice: well worth trying but bring an empty stomach. Timeless and tranquil, the Villa Corinthia Restaurant is a graceful, high-ceilinged hall with murals by Maltese artist Raymond Pitre decorating its walls. Here sophisticated starters included warm salad with dried fig chutney from a local artisan on the island of Gozo, seared pigeon breast on a bed of baby spinach, with dainty helpings of smoked tomato puree and dukkah, an Egyptian spice blend of toasted nuts and seeds, as well as yellow beetroot tarte tatin with soft sheep cheese from Gozo and roasted pistachio and lemon oil, decorated with grapefruit slices and small beads of balsamic vinaigrette. Being a Mediterranean island, no other main could be more suitable than fresh sea bream, baked lovingly in a salt and herbs crust to maintain its soft texture, then drizzled with Maltese olive oil and lemon jus for added subtle flavor. With head pastry chef, Mark McBride, at the helm, a dessert of soft polenta and olive oil cake with Ta’ Mena artisanal honey ice cream and bee pollen was an culinary echo of Malta itself – tantalizingly diverse and exotic. Our dinner at the ‘Caviar & Bull,’ proved a most enjoyable affair with food both prepared and served by a young, friendly staff, including Spanish couple, Laura Ferrer Sans on the floor and head chef, Serge Huerga Marin. After an amuse bouche of soup and a cracker of foie gras foam, we chose a selection of gourmet tapas as starters including scallops (pan-fried on a bed of lentils, thyme, carrots and peppers), tiger prawns (battered and dressed with Asian vinaigrette and wild herbs), foie gras (served on a thin slice of hazelnut and red currant toast, with balsamic and honey) and black fried calamari (dusted with nero di sepia). Run by Chef Marvin Gauci, the list of mains would satisfy the most sophisticated of tastes in both variety and creativity. After selecting the Barbary duck breast – with beetroot and balsamic purèe, caramelized apples in thyme, juniper berry and orange sauce – I can well vouch for chef Marin’s flavor-blending skills. This being the first time I have ever dined on the predator fish, barracuda, I was impressed by its firm texture which came slightly pan-fried with a light lemon and garlic juice. As for dessert, the contrasting tastes in a combo of pineapple, pistachio, coconut ice-cream and chili pepper was simply sumptuous. Posted in RestaurantsTagged Blue Elephant Restaurant, dinner, fine dining, fish, food, island holiday, Malata Restaurant, Malta, Medina Restaurant, restaurant, restaurants in Malta, seafood, Ta’Kris Restaurant, vacation in Mediterranean area, Villa Corinthia RestaurantBookmark the permalink.